Dr Nashiru Issahaku has denied releasing the statement being circulated on social media. Sources close to former Governor of the Bank of Ghana, Dr Nashiru Issahaku, say he did not author a statement attributed to him and being circulated on social media. 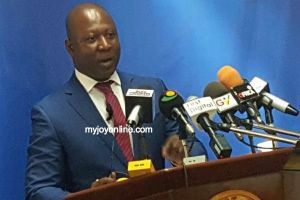 The statement purported to quote Mr Issahaku as saying “I wish to categorically state that the claim that the Bank of Ghana (BOG), under the previous NDC regime was to commit an amount of GH¢4.6 billion of public funds into the proposed switch to interconnect mobile money transactions is totally false and should be disregarded.”But he has denied issuing any such statement on the raging controversy over the cost of building a platform for seamless financial transactions by telecom operators and banks, and mobile money transaction.